Xenophora pallidula, copyright C. R. McClain. 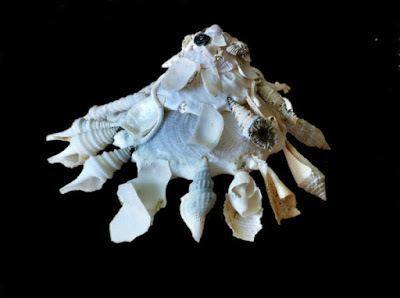 The Xenophoridae, carrier shells, are a group of more or less conical shells that commonly cement foreign bodies such as stones or discarded shells to their own shell to provide defence and/or camouflage. Characters (from Wikipedia): Shells small to rather large (diameter of base without attachments 19–160 mm; height of shell 21–100 mm), depressed to conical, with narrow to wide, simple to spinose peripheral edge or flange separating spire from base. Aperture large, base broad, rather flattened, often umbilicate. Periostracum very thin or wanting. Protoconch depressed-conical, multispiral (rarely paucispiral). Teleoconch usually with foreign objects attached in spiral series to peripheral flange and, sometimes, remainder of dorsum, at least on early whorls. Operculum horny, yellowish to brown, nucleus lateral, with simple growth lamellae, sometimes with conspicuous radial striae or hollow radial ribs. [K07] Kamenev, G. M. 2007. The taxonomic position of Bentharca xenophoricola (Kuroda, 1929) and Bentharca rubrotincta Kuroda & Habe in Habe, 1958 (Bivalvia: Arcidae). Malacologia 49 (2): 351–365. [R89] Reid, D. G. 1989. Systematic revision of the Recent species of Peasiella Nevill, 1885 (Gastropoda: Littorinidae), with notes on the fossil species. Nautilus 103 (2): 43–69.